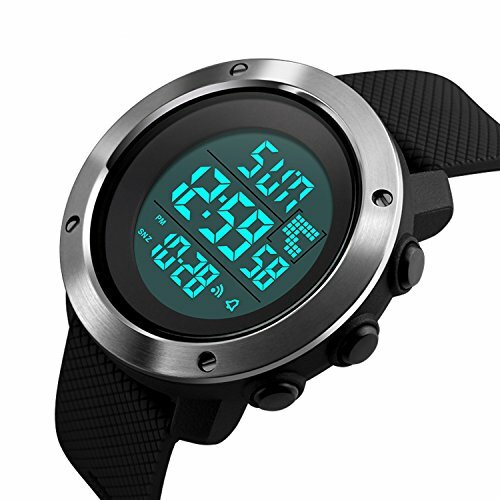 MALTIFUNCTION -- 5 ATM waterproof, alarm, chime hourly, stopwatch, double time zones, EL backlight, 12/24H format, auto calendar display. QUALITY CONTROLS -- Abrasion resistant PU band, imported Japan Movt and CR2032 battery supports the accuracy rate less than 1 second per day and long lifetime. Stainless steel back cover not easy to rust in sweat or water. SPECIFICATION -- The adjustable band fits for all people from old to young. Guaranteed at least 2 years old for daily usage. Easy to read in day and night. Small scales around the mineral cover.